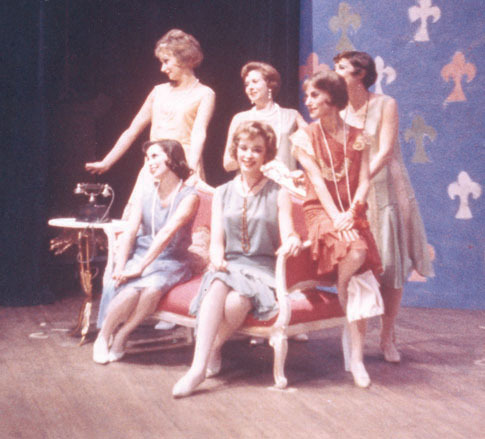 The photo of the women’s chorus from the 1965 production of The Boyfriend (April Bulletin, p. 46) was mislabeled. It was not a Little Theatre Club production but one of a series of faculty plays including, among others, The Mousetrap, The Man Who Came to Dinner, and Eva LaGalliene’s Alice in Wonderland. The Boyfriend was directed by Carol Thompson Hemingway ’52 with choreography by Irene Moll, dance instructor and basketball coach. The chorus members in the picture include, in the left of the back row, my wife Ann; and in the front row, Josie Wright, painter and printmaker and wife of Harry Wright, history professor and later provost; Harriet Hawkins, then in the English department; and Jean Herskovits ’56, then in the history department. I was a member of the men’s chorus. The shows involved a kind of interaction among faculty from a variety of fields and generations that is all too rare these days—and the cast parties were legendary! Editor’s note: The author is Centennial Professor Emeritus of English Literature. Peggy Thompson, wife of Professor Emeritus of Chemistry Pete Thompson, wrote to identify Dotty Fehnel, wife of Edmund Allen Professor Emeritus of Chemistry Edward Fehnel, (standing, center) and herself (standing, right), partially obscured by Herskovits. The photograph had been misidentified in the files of the Friends Historical Library, but the record has now been corrected. Take another look at the picture above. Click on the photo to enlarge it. Just for the record, Jean Herskovits spells her name with an s not a z. We've corrected it in the Web edition.